The Toshiba Tecra M6 ($1,494 direct) is a nicely equipped ultraportable for business travelers who want a lightweight notebook that won’t break their budget. 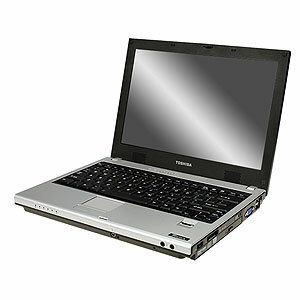 Unlike competing systems, such as the Dell Latitude D420 and the Lenovo ThinkPad X series, the M6 has a built-in optical drive (a multiformat DVD burner in this configuration). That brings the weight to just above four pounds (versus three-plus pounds for the others), but road warriors who prefer not to have to keep track of a media slice probably won’t mind the M6’s extra heft. The Tecra M6 offers a good screen and a solid mix of other standard notebook components, and it is nicely portable, all at a reasonable cost. The machine is well built, attractive and includes most anything an average business user or student might need or want, including TPM hardware-based encryption and a fingerprint reader. The TruBrite screen is very good, and while the keyboard and touchpad require some getting used to, due to key placement and size, respectively, they are for the most part comfortably usable. Aside from the LCD, which I especially liked, nothing really jumped out at me, good or bad. My overall impression is that the Tecra M6 is a fairly solid sub-$1500 thin-and-light machine, and its numerous security and protection features serve to enhance its value considerably. The included one-year warranty is a bit thin, but other, better options are available. Uncomfortable mouse buttons cramp the style of the Toshiba Tecra M6-EZ6611, an otherwise light, compact titanium-silver unit that has what it takes to get basic work done on the go. The M6 weighs 4.1 pounds and includes a nice 12.1-inch WXGA screen, a top-of-the-line multiformat DVD burner, a handy presentation button, an ample 80GB hard drive, three USB ports, and a fingerprint reader. The reasonable $1500 price (as of 9/8/06) includes Microsoft Works 8.5. Port layout is convenient. FireWire and audio ports on the front make downloading camcorder video and plugging in headphones a snap. 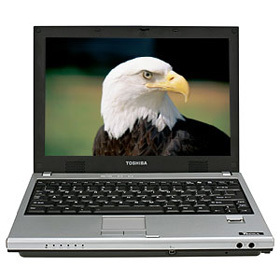 Weighing 4.1 pounds with a 12.1-inch wide-screen display, the Intel Core Duo-based Toshiba Tecra M6 notebook lies on the cusp of the ultraportable and thin-and-light categories. Designed for business users, the Tecra M6 crams features we expect in a thin-and-light--such as an integrated optical drive, biometric security, and plenty of ports--into a small package with an extremely low starting price of $1,099. Our Tecra M6 review unit had $400 worth of upgrades, making it a moderately powerful machine for a still-reasonable price. Competitors such as the Lenovo ThinkPad X60s and the Sony VAIO SZ are both more expensive and feature rich.